Find the RED BALL on this site and be one of the first FIVE people to send me an email with the location. I will post the five winners on this blog on Monday night. Your search may require a little clicking around... but there is no mistaking the RED BALL. It really is a ball... not a flower, not a button, not a logo or an icon... not any other circular object :-). The winners will receive one 10-pack of my Rose Bryant Postcards with envelopes. Have fun! 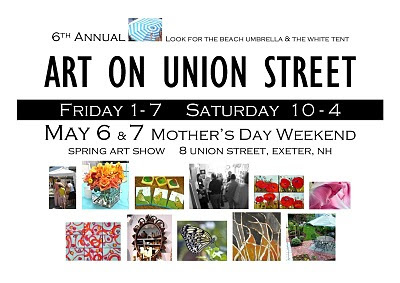 And see you on May 6 and 7 at Art on Union Street. This little painting is 3x3 on a thick chunky canvas frame. 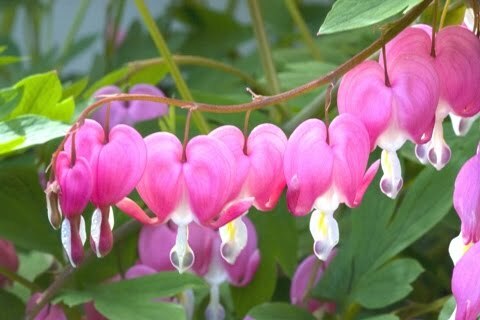 It is perky and bright, and stands up on its own. It makes me feel happy. I painted two more with this color and theme. Now I feel happy two more times. How far can I take this?! I don't know :-). Stop in for Art On Union Street, May 6 and 7 and find out. You may feel happy three times, too! Finally! Yes finally! We can see buds... and crocus... and starts to green. This is my laundry, which I line dry (or rack dry in the winter). We got rid of our dryer since we didn't use it. This kind of day reminds me of the things I know will come... lunch on my picnic table, neighbors in the street, concerts in the park, less clothing and of course, art. I have lined up more shows this season than I have usually done in the past. The first one is this Mother's Day weekend and one of the participants is Donna Jensen. She will be here discussing all things for the garden. 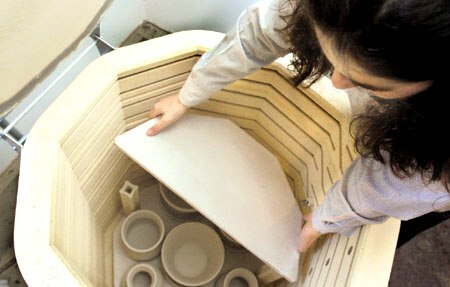 She'll have a worm composting unit, a honey bee observation hive, and answers to your garden/environmental questions. See some of her latest published work here. And join us May 6 and 7! Sometimes people ask me how I go about starting a painting. There are so many answers to this. In most cases, I first have an idea of subject matter... but sometimes it actually starts with a color that I am dying to use. The picture above shows a stage of the process when I create tiny paintings. Sometimes my larger works follow a similar path... especially if I am working on a theme for a series, say. In the case of the tiny ones above, I took a great winter photo of my back yard. Then I cropped the photo in an editing program and turned it into black and white. I see the values a lot better then and am not distracted by what the color "should be". (Those "should be" expectations can really put a kink in my day.) And I chose a rich ground color that will really create excitement as the paint gets layered on top. Then I created compositions on the canvas in another bright color... red in this case. Some compositions show the photo "as is' and some are variations... and some are completely made up. Each composition is different, making each painting different. But the paintings all tie together with similar color applications. As I apply color to the canvas, I try to leave hints of the gold ground and red line showing. I love to work in groups of similar color choices, as shown here, because it gives me a basis for color decisions from painting to painting. Hope this inspires you to pick up a brush and make a start. Have a great day in color! In progress.... Aren't we all. Thinking today of my friends and family in North Carolina and Virginia. Deb McLarnon Photography, Lori Martone Pottery at "Art on Union Street"
De Colores is a wonderful oasis for children in our community. It is a small learning center that supports cultural diversity... it's also a place where Spanish can be heard on a daily basis. 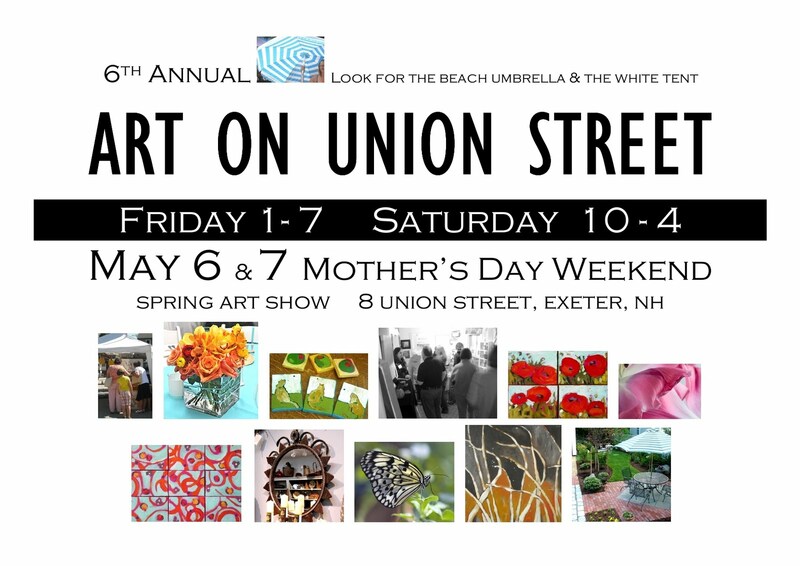 The parents of the center are joining Art on Union Street this year and organizing a fundraiser for the New Hampshire SPCA. Proceeds from the sale of children's art, lemonade, and treats will be sent to the local SPCA... where, I heard from our horse-loving neighbor Kerry, there is a brand new foal. Wow, what a way to pull you in to a good cause... just hearing "baby animals"... well, you know. Look for the party "for the animals" at 13 Union on May 6&7. It is sponsored by the parents of De Colores. De Colores is located in Exeter, NH. Their number is 772-8931. I am thrilled to have Anna Hardy Evans and Jessica Cristoferson show their creations here for ART ON UNION STREET. Anna is a furniture "artist"... She reinvents furniture ...parts of furniture, ...and parts with other parts of furniture. She makes her own paints. She uses found metal. Just this week I found her scouring a local thrift shop for the next adventure. She also is the owner of `In-Home" a local shop in downtown Exeter where she sells her creations plus beautiful items from other artisans and home decor companies. 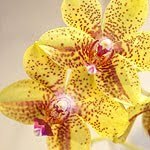 Jessica Christoferson creates elegant beauty in exotic floral arrangements and carries a collection of orchids and unusual flowers plus stylish gifts at her shop "Cymbidium". She will have arrangements here at the open house that will delight the eye ...and the nose. Be sure to mark your calendar and join us. 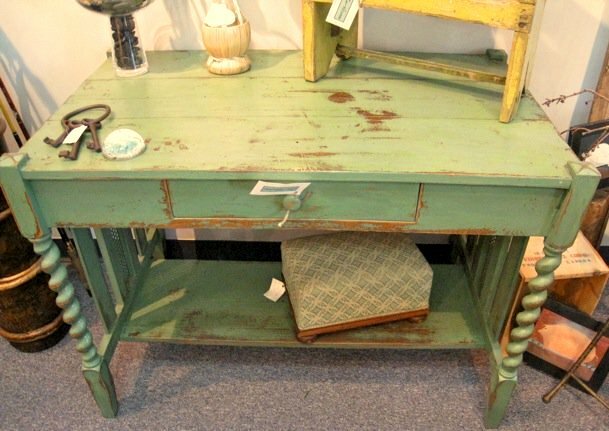 We will have lots of spring color and fun... plus, I am sure you will find an idea worth taking home. SOLD "Birds on theBeach" has landed in a wonderful new home. I always love the story of how the journey takes shape. It usually starts with the words "I am drawn to your color". When someone says that to me, I have an overwhelming feeling of closeness ...its as if they are part of my family. You know how family can give you a "look" (in a good way) or say something as uneventful as "I know" and when they do, almost nothing else needs to be said. You speak the same language with each other... so you know. "D" had seen my work before and now she decided to make this painting a birthday present for herself. She told me of an earlier painting she had purchased from another artist decades ago, how she still loves it and how it brings as much joy to her now as it did then. When she told me that, I felt so connected to her... of course I understand. I am honored that she spent the time looking and deciding and experiencing her relationship with my color before she made the decision. I hope she enjoys this painting ... for decades. Thank you "D". We are doing a really cool thing this year for the art show on Mother's Day weekend... actually several really cool things :-). One is the Visiting Artists Show...we have 20 artists joining us here each at various stages of "growth". Some as young as 7 years old and some as young as they want to be. Each is bringing one piece of art. For some it's their first time showing work, for others it might be their 25th. I can't wait to see the mix... Another cool thing, landscape designer... Jeff Hyland of Ironwood Design Group will be on hand to help you with ideas for your exterior spaces. You can schedule a 15 minute time slot with him in advance. Bring your notes, your photos, your questions and chat. I'm sure you will feel better about your directions. Contact me to schedule. The schedule is to the left so you can see how it is filling. To add to that, Donna Jensen, a volunteer with the UNH Cooperative Extention Hotline, will be here with a honey bee observation hive and a worm composting unit... I don't know if I can stand it... its going to be great. Not your typical art show... but just how I like it!